The “Say Hi To A Stranger” Campaign returns August 21st – 23rd. We are pleased to see this event continue which was created by A Cue Creative Consulting. A large study conducted in 2012 by the Vancouver Foundation shows that socializing is challenging for many city residents. About one-third of respondents agree that it is difficult to make new friends in Vancouver, and that proportion jumps to half of respondents who have lived in Canada for fewer than five years. For those unfamiliar with this campaign, the first Say Hi To A Stranger Weekend occurred on November 8 – 10, 2013 shortly after local writer Chelsea Pescitelli identified Vancouver as “anti-social” in her VancityBuzz article “Single in Vancouver: The Asocial Single Society.” A Cue Creative Consulting responded with a video and blog post that spread online. 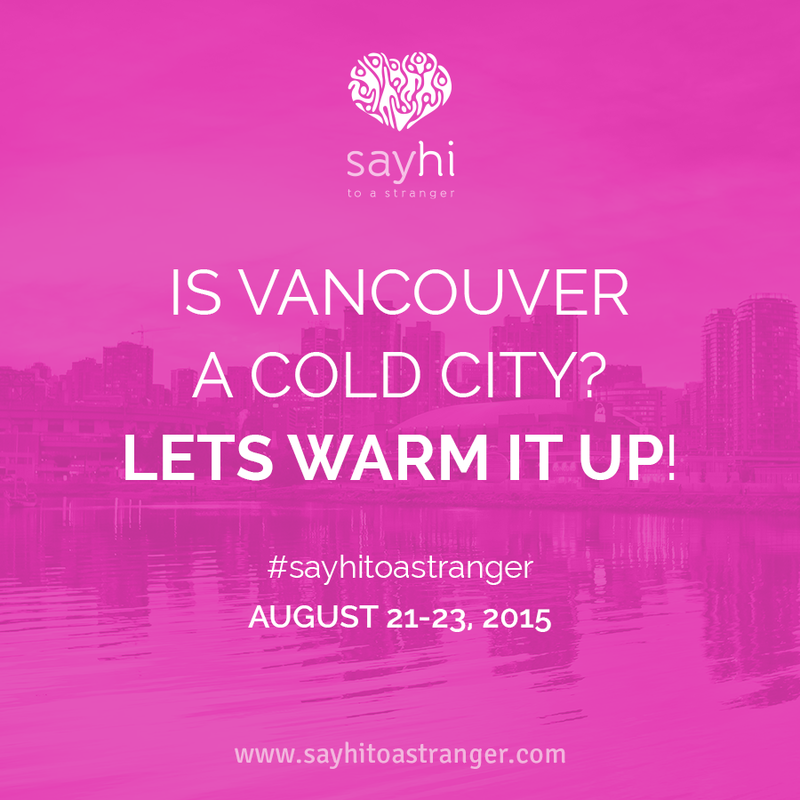 They dared Vancouverites to say “Hi!” to strangers and tweet about their experience with the hashtag #sayhitoastranger. The A Cue Creative team discovered that Vancouver could be a social and open city, but needed a push to open up and start communicating. Along with the team being featured in mainstream media, approximately 200 people gathered at the checkpoints over the weekend, and more than 5,000 people engaged with the blog and on social media online. #sayhitoastranger trended on Twitter on Thursday, November 7, 2013. We ask you, will you say hi to a stranger?